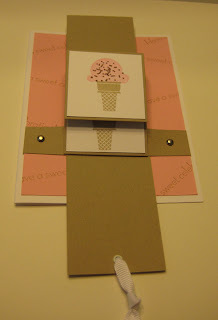 Here's another waterfall card. After doing the 4th of July card in Stamp Club, Mary Ann and I decided her friends would like it at her workshop. Since Mary Ann already had one, I thought I better come up with something a little different for her! This one features the Sweet Scoops stamp set from the mini catalog. 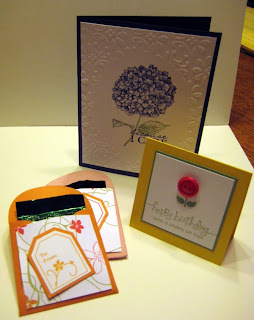 My friend, Stacey, at Stacey's Stamping Stage hosted an organized swap at convention. Following her normal rules for her color challenge, we had to use the colors, Baja Breeze, Chocolate Chip, Melon Mambo, Crumb Cake and Whisper White. 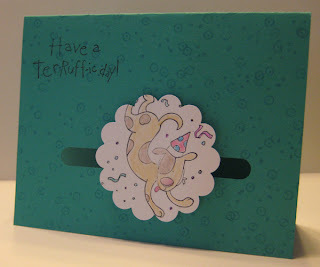 I realized I am not so good with people telling me what to do :-) I had a little trouble at first sticking to the specific color scheme, but once I got started, I found I really liked both the colors and the card I ended up with. 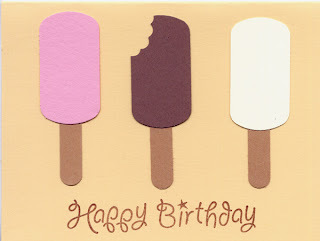 I got some great cards in return for all occasions including Christmas. You may recognize this layout and color combination from an earlier post this month. When I do my convention swaps I try to use brand-new stamp sets and colors - but I liked the card we did for a stamp-a-stack. So with a little tweaking, and lot of flower cutting, I had a convention swap with a new stamp sets and two new In Colors. Thanks to my friend Sherrie who helped me cut these out and put my swaps together. 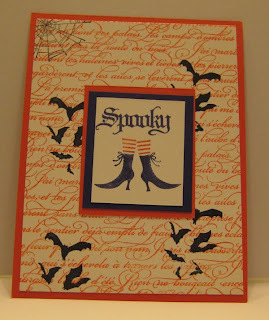 Here's one more of my swaps - ran out of this one after the Halloween card. 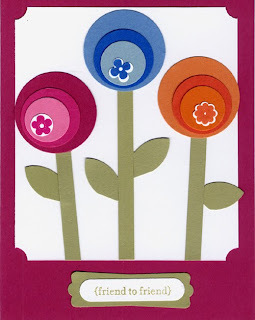 I wanted to do something manly for a change and thought this card (and others made with this set) will be a good one for my brother-in-law's birthday (s). Convention ended with a great surprise for all of us! Be sure to check back for samples made with my brand-new not even available to demonstrators yet stamp set, Designer Series Paper and accessories. It's a tradition to bring gifts to convention to share with our roommates. Here's a quick peek at what I did for mine. We've had a wonderful time and all are worn out from the late nights and early mornings. We are having days full of classes, demonstrations, make-n-takes, swapping and more. It's hard to pick my favorite moment, but I look forward to sharing with you in the days to come! This must be my most popular convention swap - I ran out of this one first! I have seen a few other swaps with it, but not too many. Tomorrow night (well actually it is tomorrow already!) all of my friends and I will be sharing pizza and looking at each other's swaps - I will be on the lookout for more ideas for one of my favorite new sets. Always a fun way to spend the evening. Thanks to all of you for coming to my new catalog open house on Saturday. The morning went by so quickly, and I had a great time. 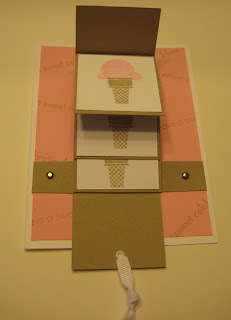 Here are the projects we made featuring new colors, stamps and accessories, and I made the little treat holder as a thank you gift. We also drew names for free stamps. Congratulations to Gail, Rae Anne, and Rhonda (who was drawn out twice!)! Isn't this great? My friend and upline, Shirley, made it for me for my birthday using the new Designer Series Paper, Greenhouse Gala, and I had the perfect spot for it in my craft room. The plan is to hang my reminders and to do lists right there by the door so I see them as I am coming and going. We'll see how that goes :-) But even if I don't, it looks nice hanging on my blue wall! At Christmastime, we did a side step card in Stamp Club. I decided it was time to try another version and this time we used the new Because I Care stamp set. 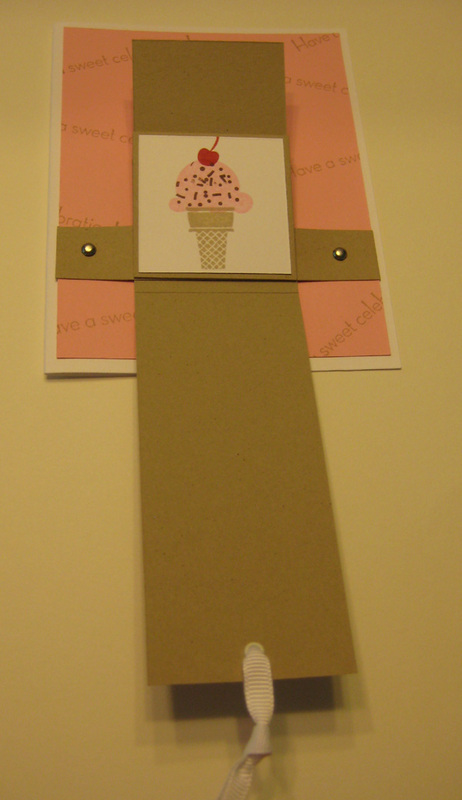 It sure is a great way for your recipient to display your card! And I just love this Concord Crush In Color and was happy to be able to combine it with some of my new Brights Designer Series Paper. 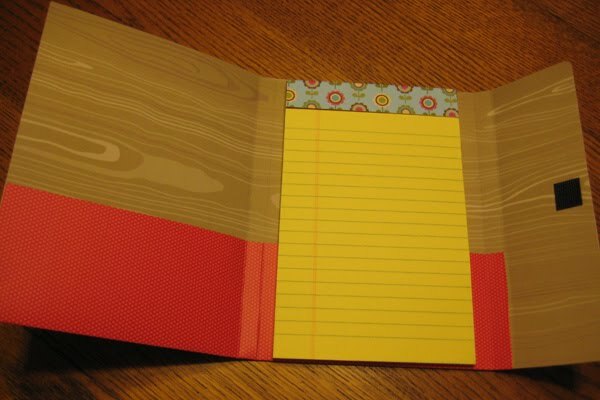 This year, the Designer Series Paper comes in a big tablet of an assortment of colors and designs. It's a nice way to have all of the colors at your fingertips. 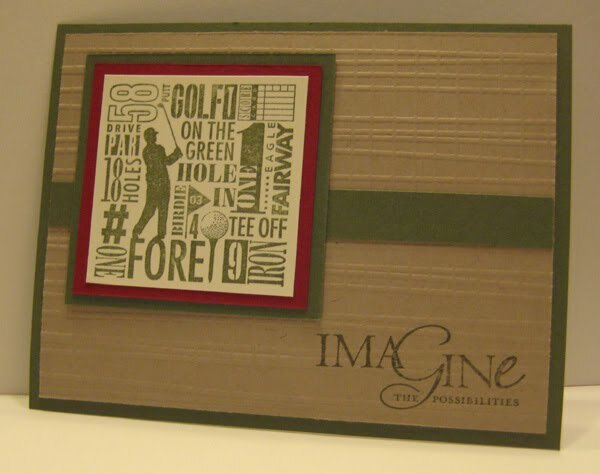 This grid technique card uses all new products - colors, stamps, and punch! To create the grid, simply line a piece of cardstock up on your paper cutter and make diagonal score lines at even intervals. 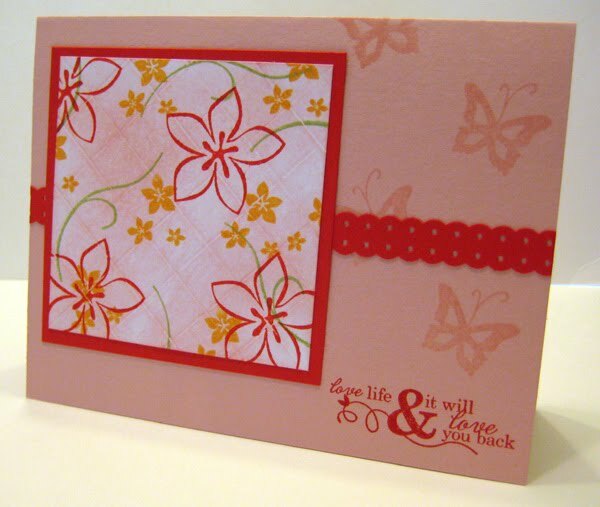 Then sponge a light color over the area (you could also stamp it with a background stamp) and stamp. 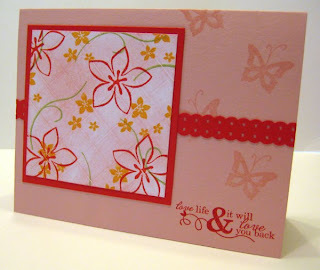 I used the new In Color Blushing Bride for sponging and the new stamp set Cottage Garden. 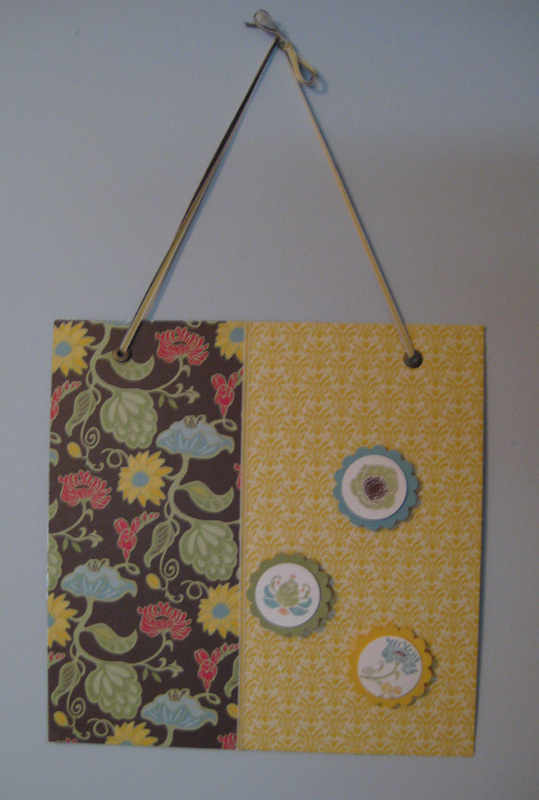 I took my color cues from the Sunny Garden Designer Series Paper and also used Poppy Parade and Pear Pizzazz. For an added embellishment, I used the new Dotted Scallop Ribbon Border punch. 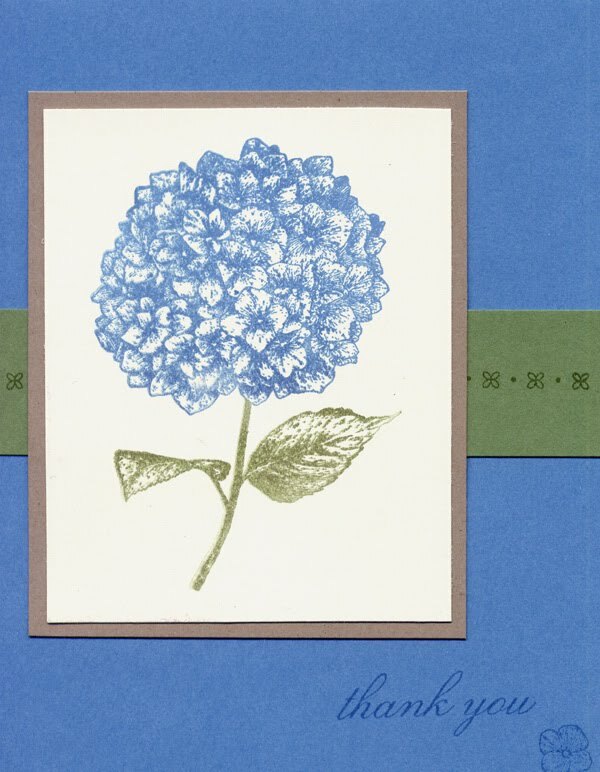 Don't forget about my New Catalog Open House on Saturday, July 17, 10:00 - 12:00. Stop by take a look at the catalog, view some samples, make 2 free make-n-takes, be entered into a drawing for free stamp sets and enjoy some visiting and refreshments. You'll have a lot of ways to win a door prize! Plan to stop by and bring your Wish List so you're ready to place your order! The drawings for a FREE Stamp Set begin at 10:30 a.m. and each $15 you order gets you an extra chance to win! Can't come? Email me or call (217 483-9195) with your open house order and still get your name in the raffle! Think you've done it all with the treat cups? Have you tried water? That's right. Water! A few months ago Leslie demonstrated this at our Spring into Stamping meeting (she credited Vanessa Webb with the idea). I added a small amount of Dazzling Diamonds and filled the treat cup nearly to the top. I think I will advise the stamp club ladies to go even fuller than I did. You can't really see the glitter in the picture, but it really looks like a snow globe. I also ran the bottom piece of Marina Mist through the Big Shot with Texture Plate Kit #4 to create my "waves". Fill the treat cup, remove backing to reveal the sticky part of the treat cup and then stick completely to a window sheet. Then assemble the card as you would any other card. I am so glad there are creative people out there to come up with these things. I have heard of people putting drops of dish soap in the water too, but I like the glitter well enough I didn't try the dish soap. For just $35 any former Stampin’ Up! demonstrator can resign this month! Take advantage of the discount while building a collection of the new colors or restocking your existing stash. If you sign now, your benefits will last until January with no commitment beyond that if you decide this is not for you. In the meantime, you can enjoy a 30% discount on your first order and 20% on all orders you place. 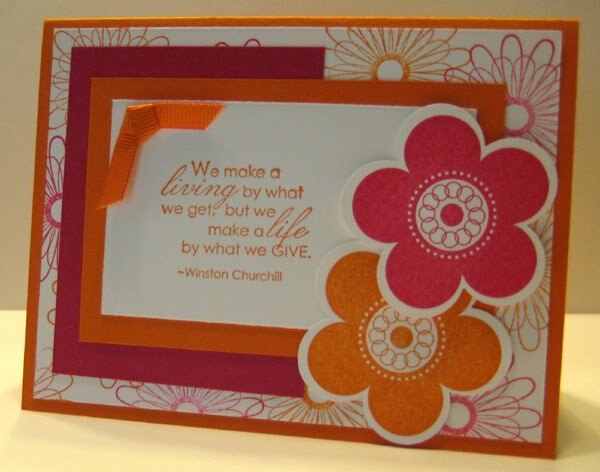 If you have never been a Stampin’ Up! demonstrator, check out the new revamped Starter Kit at the new price of $175. The great new colors are there, and more substitutions than ever. I would love to share more information with you. Contact me today! My order full of new cardstock, ink and stamps arrived Friday! Yesterday I was out of town so today I have been designing possible convention swap cards and working on Tuesday's stamp club projects. So many stamps, so little time :-) I realized recently when talking to a stamp club member that there are a few tools we have never used in club. 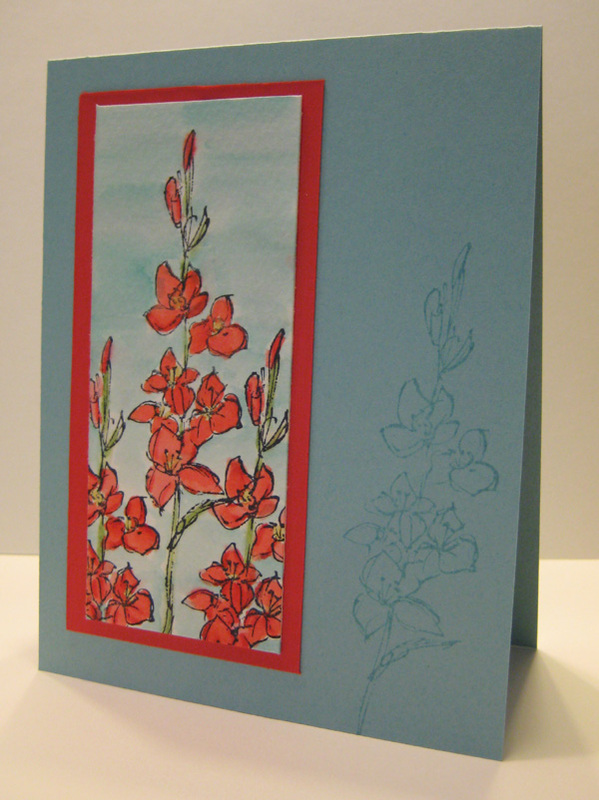 So this month one of our projects will feature watercolor paper and an aqua painter. I am not a colorer so my club members don't get the opportunity too often. But this stamp set makes it easy to create a water colored project, and I have a feeling they will get the chance again soon. 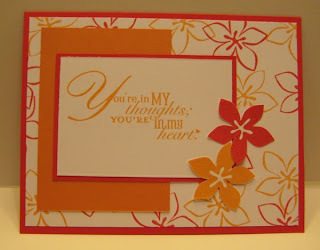 I stamped the images with black StazOn and then touched the center of the flowers with a So Saffron marker. 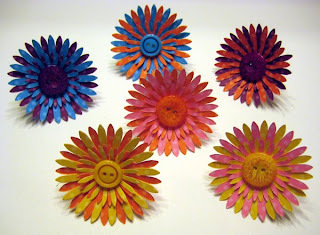 I then highlighted the edges of some of the flowers with my new In Color Poppy Parade marker. I used the aqua painter to pull and blend the color, but I found in order to get the bright color I wanted that it was necessary to pick up more color from the stamp pad lid. Keep checking for projects made with my new goodies. Though I tried to show some restraint with my order, it came in two boxes... if that gives you any idea of how well that plan went! 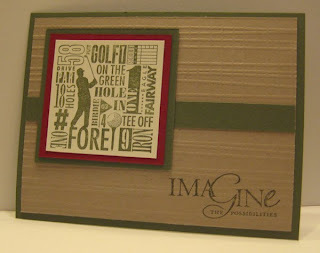 And here's our last stamp-a-stack card from last weekend. 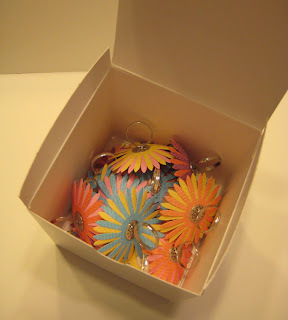 It used the flowers from the Level 2 hostess set in the current mini catalog, Punched Posies. I took my color inspiration from the Island Oasis Designer Series Paper in that same mini catalog and used the Rose Red and Pumpkin Pie combination. I ended up using a lot of cardstock because I really liked how the two colors looked with the Whisper White. I wanted to be sure to do something the kids would really like. We used the bubble wrap technique to make this card. They loved the bubble wrap so that was a hit. And one thing I know about kids is that they like punching with punches. So we used the retired tag punch to make these ice cream bars. All I can say is there will be a lot more punching this week. 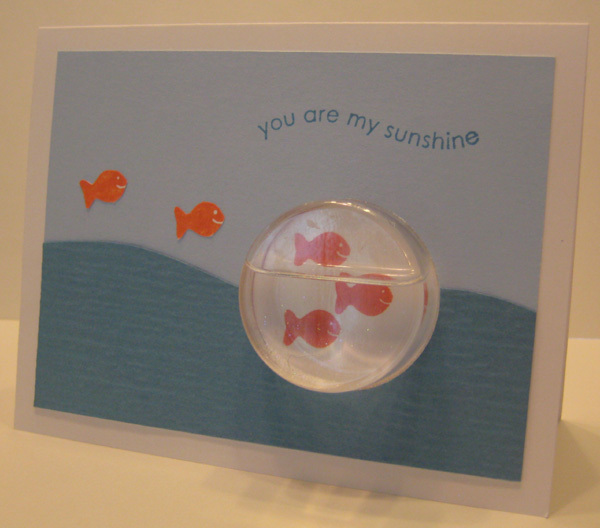 I knew I wanted to make one of these lollipop cards when I began seeing them around the internet, and I especially liked the one my friend Mary Ellen made. 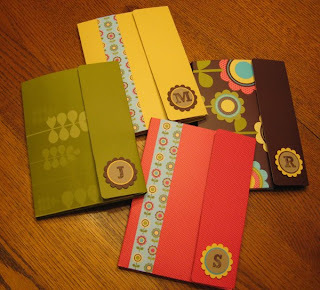 I used hers for my inspiration and used as many of our new colors of cardstock as I could. This was one of the stamp-a-stack cards we did this weekend. With the Teeny Tiny Wishes stamp set having so many choices, it made it easy to create a great all purpose card. It's not at all hard to make, but it does take some time gluing down all of the pieces. That 5 petal flower punch came in handy once again for something other than a 5 petal flower - we used it to create the leaves. 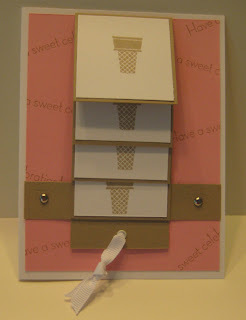 This new level 1 hostess set was free to demos with our June pre-orders. I am so glad it was because I am finding that I really love it. 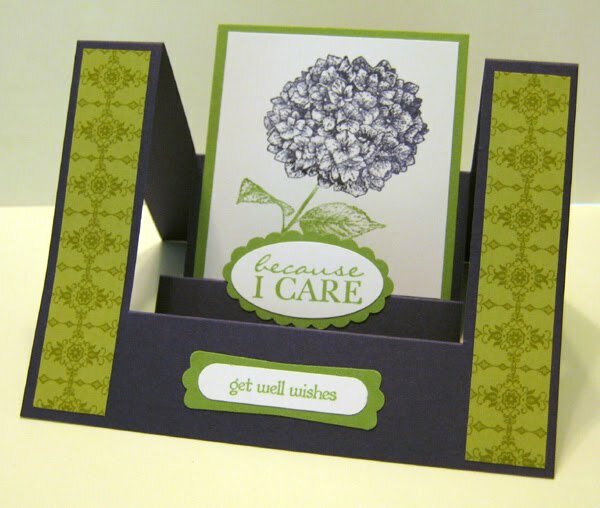 It give the look of shading and coloring and makes a very pretty card in a short time. So just imagine what some shading and coloring could do for it! The other thing I am loving is playing with our new (and old) colors - it just seems so easy to put the cards together with these color families. I used Crumb Cake, formerly known as Kraft, returning In Color Wild Wasabi, and new color Marina Mist. 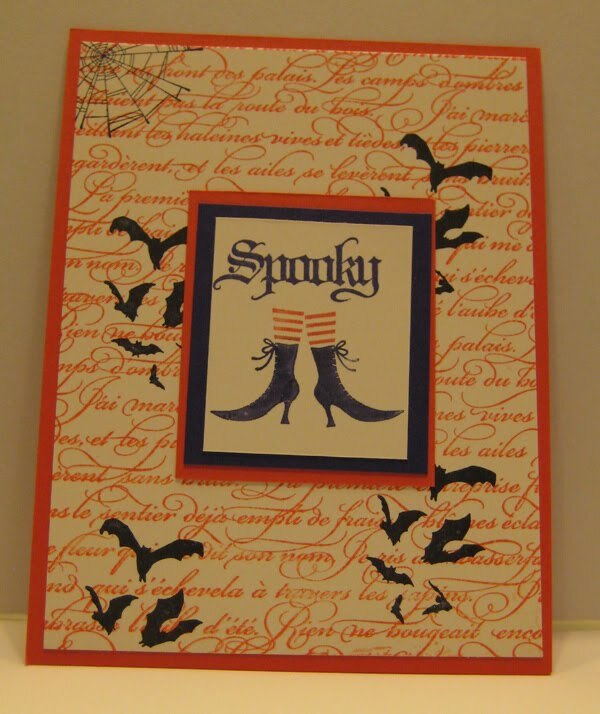 This is one of the Stamp-a-Stack cards we will make tonight and tomorrow. If you are local and want to join us, just let me know. Today is the day - the new 2010-2011 Idea Book & Catalog is here! I have been pouring over mine, creating a wish list must have list. And it's a long one! I started with all of the fantastic new colors of inks, cardstock and ribbons. But how could I stop there? I have accessories and of course stamps on that list too. I will be poised at my computer at exactly the stroke of noon (MT) ready to place my order. 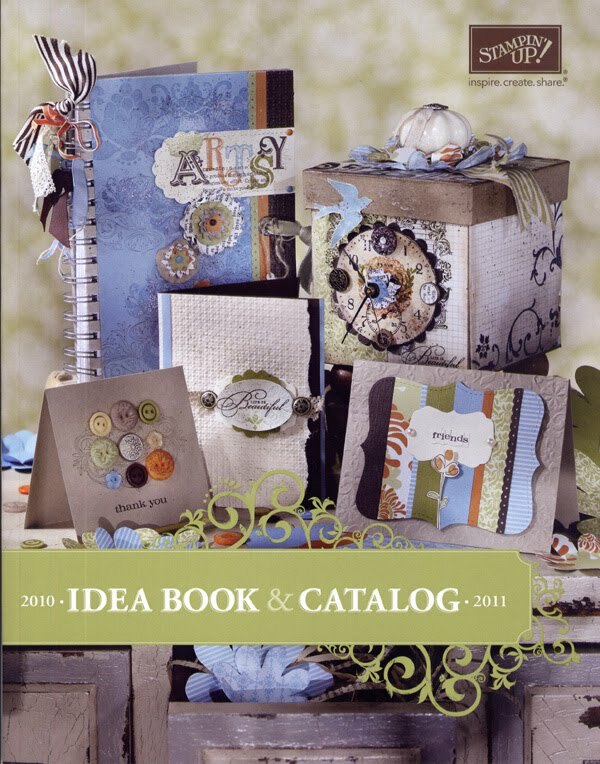 Browse the catalog online if you don't have a catalog of your own yet. 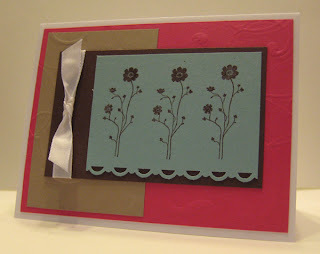 To Order Stampin' Up! Products On-Line 24/7, CLICK HERE!